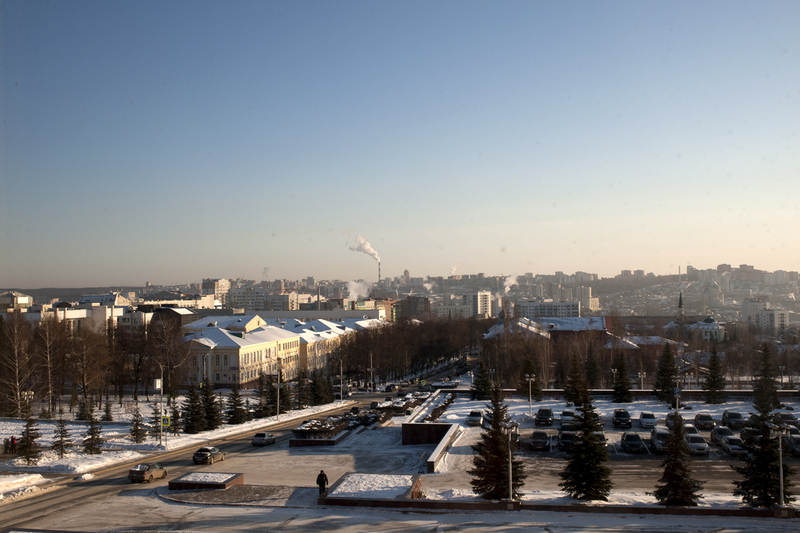 A view of the city from the offices of the Bashkir presidential administration. Last week, Itar-Tass sent two of my American colleagues and I on a press trip to Ufa, the capital city of the Russian republic of Bashkortostan. Ufa is only two hours away by plane but culturally, it is a world away from Moscow. Bashkortostan is a sovereign state within the Russian Federation and has historically been one of the most independent republics in the country’s history. Our main reason for going to Ufa was to meet with the republic’s president, Rustem Khamitov. Unlike his predessor, who was elected to office, Khamitov was appointed to his position in 2010. It is likely that Khamitov, only the second president of Bashkortostan, will also be the last. The Russian government is set to change his title in what some see as a move to diminish the autonomy of the regional republics. But for now, Khamitov is president and his administration is focused on promoting industrial and economic development in the region, which in the past few years, has been growing steadily. Coincidentally, my husband is from Ufa and since the first time I visited in 2004, there have been noticeable changes in the city. I was surpised this time around to see how many new shops and restaurants had opened in the center, hopefully a sign of a growing middle class. A good deal of this economic growth is due to Bashkortostan’s rich natural resources. Ufa is an oil and gas town, a fact that has allowed it to develop slightly faster than other regional cities. But in a country almost entirely dependent on energy-sector profits, I fear this may further threaten the region’s independence and consequently, its ability to protect local traditions. The culture of Bashkortostan, and the region’s native language of Bashkir, has been kept alive in Ufa. Both Russian and Bashkir are used officially, though we did notice during our trip that some newer signs were written in Russian only. Lamp posts on the city’s main boulevards were strung with lights in both the blue-and-red of Russia’s flag and the green-and-white of the local government. Ethnically, the region is a mix of Bashkirs, Tatars, Russians and several other ethnic minorities. Religion is also a central feature of the local culture. The population is split almost evenly between Orthodox Christian and Muslim believers and Ufa is home to many mosques and churches, most of which were only built or restored after the fall of the USSR. On our first day in the city, we visited the Lala Tulpan mosque, named for its two red-and-white minarets that resemble tulips. Another highlight of Bashkir culture is food. While I have been to Ufa several times, I have never before had a chance to try Bashkir food (my in-laws are Russian and Tatar.) Local specialities are конина, horse meat, and кумыс, a drink made of fermented mare’s milk thought to have many health benefits. I grew up around horses and the idea of eating them made me a little queasy, but I think it is important to keep an open mind while traveling. The meat was very dark and very gamey with a taste that I could not really compare to anything else. The кумыс was also unlike anything else I had ever tried. Slightly acidic, not at all like milk and both a little sweet and a little bitter, it was certainly an interesting meal. Local honey is a point of national pride in Bashkortostan and evidence of this is everywhere. It is sold all over, in containers ranging from re-filled plastic bottles at roadside stands to elaborate, bear-shaped wooden sourveneir pots. Concerned locals will warn you to watch out for the fake stuff–watered down with sugar–lest the reputation of this local treasure be tarnished. And while I truly enjoyed our opportunity to see real Bashkir culture on this trip, the downside was that our experience of the city was tightly controlled. The visit was sponsored by the local administration who were both exceptionally hospitable and exceptionally careful about exactly what and who we were allowed to see. Taking an unsanctioned Marshrutka (mini-bus) ride from our hotel one night, I felt a little like a kid sneaking out of the house. Ufa, of course, has its problems, but we would never know it. In fact, on many of our excursions, we were not able to speak with any local people. I know from previous trips to the region that many parts of Ufa are still struggling to develop. The local universities are some of the best in the country, but there are not yet enough local jobs for graduates. While the center of the city looks more beautiful than ever, many outlying neighborhoods are still troubled by bad infrastructure, and crime and widespread corruption are, as even Khamitov admitted, still a problem. On my last day, I was able to speak with one non-government voice. Professor Marat Kulsharipov is an expert on Bashkir history and the chair of the history department at Bashkir State University. He voiced concern about increasing efforts by the federal government to diminish the autonomy of the region and in doing so, the Bashkir culture and language. He had a lot to say, so I will write-up the full interview in a seperate post. All in all, my experience of Ufa this time around was enlightening, in that it gave me a much better understanding of how the local government operates and how they would like to be viewed by the outside world. The president seemed to genuinely care about the region, but also seemed to feel that his hands were tied by Moscow. And despite differing opinions about the future of the republic, everyone we met, including my family and friends who were not part of the “official” tour, did agree on one thing–Bashkortostan does have the best honey in the world. This entry was posted on Monday, December 17th, 2012 at 8:10 am. It is filed under Blog and tagged with Bashkortostan, ICFJ, Russia, Travel, Ufa. You can follow any responses to this entry through the RSS 2.0 feed.